Black Gold vs Black Garden: Will Aliyev trade Karabakh for oil despite his continuous bellicose rhetoric? The Azeri cabinet held a meeting a few days ago during which president Ilham Aliyev made another set of radical and bellicose statements. “Our military capacity is increasing. Constant attention is paid to this area and this will continue. We are creating a powerful military industry and at the same time we are buying and will continue to buy a large amount of military equipment, weapons and ammunition. I’m not talking about weapons of defense. We are buying tanks, artillery, combat aircraft, different weapons, all the modern equipment needed for combat. I can say that we also have a diversified policy and do not depend only on one manufacturer. The number of countries willing to cooperate with us in this area is growing, and we have the capacity. Unlike some other countries, we do not get anything for free, we pay with money, and this will continue. “Every minute, every day brings us closer to victory. Every day Armenia is declining while Azerbaijan is growing in strength. Every day we are moving closer to the day of victory. 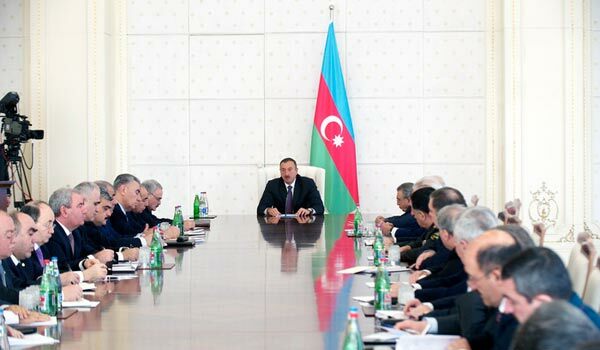 The day will come when the Azerbaijani flag will fly in Khankandi and Shusha (Shoushi),” vowed Aliyev. (Khankandi is the Azeri version of Stepanakert, capital of Karabakh which in turn is translated from Azeri as “black garden”). As for the increase of Azerbaijan’s military budget, Artur Rasizade, head of the cabinet of ministers, said that over the past eight years Azerbaijan has increased military expenses twenty times, and “it’s the biggest growth of military budget in the world for such a short period”. Stockholm International Peace Research Institute (SIPRI) experts share this opinion; according to their report of April 18, by the tempo of increase of its military expenses Azerbaijan came first worldwide. “In 2008-2011 Azerbaijan increased its military expenses by some 60 percent,” state the experts at SIPRI, adding that the military budget for 2011 alone grew by 89 percent.The dramatic growth came in the middle of increasing warnings of renewed conflict over Nagorno-Karabakh,” the report reads. In 2012 Azerbaijan has allotted around $1.8 billion to defense and security, increasing by 1.2 percent as compared to 2011. For comparison it should be noted that in the same 2011 Armenia’s military expenses did not exceed $350 million, and $400 million is allotted to defense in the state budget for 2012. And nonetheless, is Azerbaijan truly ready for war right away? Azerbaijan’s state is being built on oil, and the current price for oil has a positive impact on the country’s economic indexes. Under the circumstances Aliyev would hardly go for a cardinal shift of affairs. What is Azerbaijan to lose – not theoretically, but quite practically – should the war be resumed? First of all it is the country’s attraction for investment in the oil sphere, in other words – the only stable basis for building the state. The “Contract of the Century” with 13 most influential international companies representing eight countries was signed only in September of 1994, meaning after the hostilities were over and ceasefire was signed, thus, in the event of war no company would ever go for what would appear to be a risky venture. Most important participants of that project, such as the British Petroleum, U.S. - based Chevron, Devon Energy and Amerada Hess, Japanese Inрex Corрoration and Itochu Oil, Norwegian Statoil and others, are the first to oppose the resumption of active hostilities. From this perspective the Contract of the Century is a double-edged sword: on the one hand it makes Azerbaijan a truly wealthy country, on the other hand it infringes upon the country’s sovereignty and deprives it of a chance to start war, when it wants to. And besides the fact that a new war would minimize the level of Azerbaijan’s investment attractiveness, it is also completely capable of destroying the whole pipeline communication, which is rightfully considered to be the main artery feeding the Azerbaijani state. The key is that practically all of Azeri hydrocarbon is transported via four pipelines, three of which lie within a few meters from the frontline, both on the northern borders of Nagorno Karabakh and on the northern borders of the Republic of Armenia. Namely, those are Baku-Tbilisi-Jeyhan oil pipeline opened in July of 2006, Baku-Supsa oil pipeline that’s been functioning since 1999 and Baku-Tbilisi-Erzrum (South-Caucasian pipeline), officially opened in March of 2007. Armenian cannons are currently aimed at those three communications, and in case war breaks out, their first task would be destroying this vitally important infrastructure. Hence, Azerbaijan might not only lose its investment attractiveness, but also all of its main communications supplying hydrocarbon raw material to the outer world. President Aliyev is more than aware of the scale of these threats. The only layout that might in theory be favorable for the start of new war is either sharp decline in the positions of the Aliyev clan, or catastrophic drop of oil price (say, below $15 per barrel). So far, none of it seems to be on the horizon.